Roilo Golez was the last person I thought would die so soon. The former lawmaker and national security adviser was lean; he looked fit and was active. 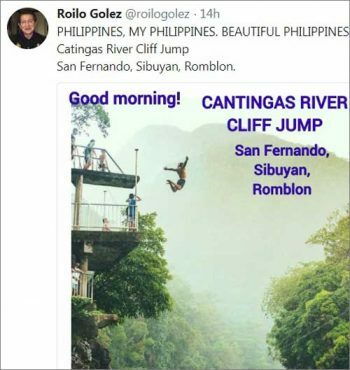 In retrospect, it seems that while he was saying “Good morning!” Philippines, the photo was really that of Golez leaping into eternity. So long, Sir. I will miss interviewing you. I will miss your patient explanations. To the end, Golez was tweeting and writing about the West Philippine Sea and standing up for the rights of Filipinos. He died on the eve of our Independence Day. One of his last tweets was a personal appeal to President Rodrigo Duterte to file a diplomatic protest on behalf of Filipino fishermen whose catch was being seized by Chinese coast guards. “We Filipinos should stand up for this man. Mr. President, Sir, I appeal to you to order the filing of a strong, publicly announced diplomatic protest. Golez insisted that the fishermen were being bullied, contrary to the government’s denials. I have an idea, Sir. Do you think you could spare a moment to visit Duterte’s bedroom, you know, the one with the mosquito net, and remind him yourself everything he should be doing to ensure that the West Philippine Sea benefits future generations of Filipinos? Perhaps, now, he will listen to you. It’s very regrettable and sad that this govt is easily giving away the islands that may contain rare elements and minerals. It is also easy to trust and be confident that sharing of the sea minerals and seafood with China would be the true reality ,,, but its not, look how they take away the fisher men’s pitiful catch for food and to make a living. It is also regrettable that the only pride of the Pinoys are the hundreds of islands that maybe hiding the riches of the country. It just needs a leader with the guts to uncover them without selling the parts and parcels of the archipelago. I guess the country is not destined to be great but rather on a decline of morals and skewed values and behavior. Here is a link about the sweet affair developing between the U.S. and NOKOR. We can only watch and wait for the crumbs of whatever is handed by the big investor aka colonizer. Other countries have reached and almost conquered the outer space while the PH just got deeper into the abyss of begging for loans, creating debts it can handle to pay, making more steps backward that instead of motivating the citizens to explore and move forward, they are killed or threatened with murder or save with a kiss ,,, yuck! Sir Golez may have gone out of this life, but maybe he has better things to do on the other side for the Filipinos sake.Hope! uhm, the agency under andanar got roilo’s name wrong, he, he, he, called him rogelio, disrespectful of the dearly beloved is andanar. ang laki ng mata ni andanar; budlat, and yet cannot see how golez’s given name is spelled! and laki laki ng sweldo tapos halos walang proof reading skills. and despite having numerous staff na mga univesity at college graduates kuno, mistakes still follow andanar. perfection is there for all men, the song goes, but not for andanar, betting ako he is not man but simulacrum. then rolly polly quite contrary harry roque said to cut andanar and cohorts some slack. methink po, too slack na sila laylay kaayo, at karon, them slackers are resorting to mandarin chinese na, he, he, he, what the helluva? hindi pa nga nila kabisado ang use of english language, move on na sila sa mandarin chinese, not cantonese? chinese programs are being shown na sa govt sponsored media outlets. the slackers cannot even identify by sight and sound whether them programs are in mandarin chinese or cantonese. no eye for details, he, he, he. palpak na naman. the chinese must be pleased. one wong (wrong) cannot make a . . .
to be charitable po, hik, andanar should have both his sight and hearing tested. he may have problem with hearing frequencies, he, he, he. eye acuity is medyo problemtic din. I just hope that what he is fighting for will not die and fade away. many old soldiers are fading away, while the living ones who are alive and well and breathing the likes of lorenzana and esperon are not doing a thing! good only they are for fist pumping and paid very well for less to no work done. he, he, he, halos walang productivity! except perhaps creating mileage and amassing expenses, mga comfort men na sila ni digong, go where he goes, fist pumping all the while. sometimes po, we have to learn how and when to detach. it’s for the good of our mental health. we cannot take in all the problems of the world for it will be like eating an elephant. too big and you’ll choke! but you can take one bite at a time and that elephant will be eaten up, eventually..
depressive? go out, take a walk and enjoy the sunshine and get free vitamin D from the sun, makes one less depressive. apparently vit D is good for boosting the immune system, but dont stay out too long baka mapagkamalang tambay at mahuli tuloy. some people go to church and just sit there, beats being tambay and in the peace and silence and flickering candles, wisdom comes to them. Still the 8 justices maintained their ‘rains’ on Ex-CJ Sereno today’s Inquirer’s News. Reigned out. CJ post is officially vacant now. 8-6 to concur Tijam’s ponencia – for SG’s quo warranto petition. Technically bypassing the Constitution’s provision, lawful process on how to remove impeachable officials. Congress has been rendered ‘inutile’. It is now ‘moot and academic’ says House Justice Committee Chair Umali on his committee’s Articles of Impeachment against CJ ML Sereno. They’ll just go thru the motions, by filing or presenting it to the House Plenary. Peoples’ Representatives (Congressmen and Senators) have been cast asunder. Political Justice Appointees arrogated the Legislature’s mandate. A day of infamy. A report, sort of …? Ousted chief justice Sereno speaks before an exuberant crowd at UP Diliman. Under the glare of a spotlight and before hundreds of cheering supporters, ousted chief justice Sereno stood with a smile. mali po si roque, the supreme court is not final arbiter sa ouster ni sereno, congress was, alvarez was and judiciary budget made it so. alvarez can easily squeeze the purse, bringing supreme court to heel. That and other info were to be divulged in the Senate impeachment hearings against SC CJ ML Sereno by the Lower House Prosecutors. The House, so far, denies the CJ ML Sereno that opportunity. They can still do and pursue it, regardless what the Judiciary arrogated. IF The House is fair minded and zealous of their Constitutional mandate, the LH Justice Committee’s Articles of Impeachment can STILL bring it to the House Plenary for a Vote. If Voted, elevate it to the Senate for the Impeachment proceedings. Which is supposed to be. But alas, the Lower House leaderships seems content to skirt under the SC’s mal-jurisprudence (seppuku without honor). Bad influence ang Executive Leader, PRRD! na prrrrt ang pinas sa dumadaang anos. From ‘Opo’ to ‘put??? ina’? Presidential Spokesperson Harry Roque responded when asked if Malacañang thinks it’s okay for young Filipinos to adopt the President’s conduct. Shifts the blame, responsibility to parents, who may have voted for him, ’em into office. parents, if they only knew then what they know now . . . there is still big chance concerned teachers and parents can correct the mistakes of this buang in situ by not voting his federalism and dismissing it altogether. federalism will bring in more of the same bad language and equally bad manners , shoddy work with no eye for details, getting names wrong, etc. basta may cussing okay sila,prolonging the agony. vote no to federalism and let us have a proper election next year in 2019.
parents teachings and their discipline can only last until, I think, early adolescence before it gets tempered. by late adolescence, parental guidelines should have set in concrete and consolidated, their teens on the way to becoming young adults and hopefully making right decisions and choices. in the quest of finding their own identity and what they want to be, teen will look more to their peers and society and be further influenced by them. and parents job will have already ease off by then. identity vs isolation, if roque knows about developmental theories of growing up specially those of piaget and erickson, he would have understood more. kaso, dumb down na si roque ngayon, bumaba ang IQ, hanging around siya kasi with dimwits! he, he, he. All hedges of PRR Duterte as President are all down. Come What May to Save The Republic. Even those called, came to bear false witness against one of their own. End. According to UNConstitutionally Ousted CJ ML Sereno, SC Spokesperson Theodore Te relayed to CJ ML Sereno that Majority Floor Leader Rodolfo Farinas had told Justice Peralta that Speaker Pantaleon Alvarez had ordered the suspension of the deliberations of the budget of the Judiciary, unless all documents that the complainant requested would be released. The same message was relayed to the SC En Banc in one of its sessions. in times of need and under difficult circumstances, methink po, the 6 justices are able to work with limited budget, like what most people are now doing: tightening their belts dahil this govt is squeezing money like blood from stones. the bent 8 are afraid yata they may have to bring their own toilet paper to work! he, he, he. justice martires is jumping ship and applying for other jobs na, broke the enblanc na. dinumihan kasi ang supreme court and leaving for greener pasture. I hope the Philippine Navy honors Golez by naming a ship or a naval base after him. Preferably one that is tasked to defend the West Philippine Sea. Salute Sir! Not possible during PRRD’s term. First of conduct unbecoming of a Senate President? Celebrity haunts his Senate presidency. From sitcom ‘Iskul Bukol’ – Wanbol University, a joker comedienne to a lawmaker … from scripting jokes to legislating bills to become as part of the laws of the land. Now he oversees senate committees on the state of affairs of the country… yet it hasn’t been aired if he has already graduated from Wanbol University. itong graduate ng wanbol uni, ginawang yatang state affair ang personal affair niya ngayong senate president na siya, abusing of power na baga. for him to attempt a ‘quo warranto’ of previous inquirer’s articles like it had not existed, not read, not published, not written, not okayed by editors, is pervertive of events. the pepsi paloma articles it’s on public record, and ought to remain public, not deleted just to please wantbo graudate. may slippery road effect po ito; madulas and many will follow. today it’s removal of pepsi paloma articles, tomorrow mga ibang articles na naman po ang ipapa-delete. this sort of precedence is dangerous and should not to be indulged. and since we still live in a democratic country, wanbol graudate should do the right thing and file court case petitioning for the removal of said articles. idaan yan sa tamang processo. Star quality, now a revisionist – changing HIStory for a clean slate? not yet clean slate, he would have to delete plagiarism attached to his name too. for total clean, he would have to be reborn and naked as he came. wishing maybe, he has not met pepsi and got sweep-ervescenced! he, he, he. Pepsi is still available nationwide. Putong puto ang sales marketing and advertisement ang pampalamig. Mananatiling buhay ang meme, political baggage ni Tito Sotto iyan. uhm, if may isip pa siyang natira and not overly drunk with power, he could buy off the copyright of rodel rodis’ article. ‘yan problem solve kaagad. kaso, barat e, cheapskate kaayo: dami daming pera pero gusto libre at ayaw gumasto. truly, newly powerful man could offer to buy the copyright off rodel for say, 5 million pesos? senate pres na siya, mas mataas ang ranggo at higher ang status, hence the 5million price. rodel rodis, please use your brain! common prac po yan to sell copyrights to interested party. business lang po, no malice. sell the copyright and be done with the articles. rodel, wherever you are and in case mulling ka pa at undecided about what to do next, bear in mind po you can delete the articles. pero since hawak mo ang copyright, you can re-publish said articles again and again and for as long as the duration of the copyright. I know alam mo ito dahil writer ka. all writers know about publishing contracts and copyright laws. at alam na alam din ni sotto all there is to know about copyright laws dahil mambabatas yan, dating senador and now, all powerful and mighty senate pres na. copyright mo yata is for 25yrs, tama ba? 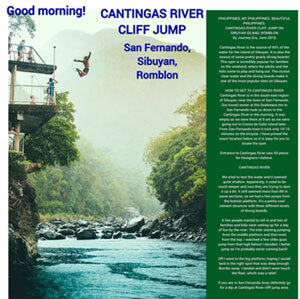 after that, the articles divert to public domain and out of bounds to you. but if you sell the copyright to sotto now, he’ll take immediate ownership of the articles, to do as he pleased, and you’ll be out of the scene sooner. win win yata yan for both sotto and you. if I am being presumptive, my apologies po. Sec. Bello III – does not like his labor-work anymore? SC J. Martires – from a high-safe post to on-spot-risky-post? Atty. Edna Batacan – PDutz lawyer to Ombudsman? J. de la Cruz – Sandiganbayan Court to Ombudsman? Atty. Rico – legal practitioner to Ombudsman? Judge Espero II – a judge to Ombudsman? SUBMIT your complaint. Report or Oppose any of them. This is ENCOURAGEBLE ! Good luck. . . Still UNDER MODERATION. Thank you if/when RELEASED. mukhang merong hang-over si pareng akismet, dala ng katigasan ng walo sa hudikatura. catholic church complained that justice martires should be martyred, he, he, he and not given the post. martires saying those religious are mentally deficient. pinatamaan si sereno pero marami ang na-barter e. so many religious in pinas na nagapapako during lent, dinagsa rin ang translacion year in and year out, same as undas which is national holiday, all souls day. so many debotos. I bet, if martires becomes ombudsman, he is going to be mean to religious people and could well decide against them, biased siya. When J. Martires applies for Ombudsman post, what does it show? He is a new member of the SC and now wants to change his ‘clothes’? Does he not like being a SC justice? Why would he transfer to Ombudsman? The ‘oath’ of office of a SC justice says: one will remain and retire as justice until reaching 70 years of age. . . nasa sa Constitution and laws yan. Why are ‘incumbents’ seeking TRANSFER? Reason? Nobody knows including those seeking transfer. in pinas po, those with lower IQs are spreading fake news, allowed to and paid well, some work for the govt too, he, he, he, and serving chinese interests. example po, sabi china’s military plane landed recently in dabaw to refuel kuno. a refueling that lasted 3days! santissima trinidad! baka sinipsip and buong oil supply ng dabaw now that china is apparently cutting cost on oil. hindi lang yata fishes at territory natin ang ninanakaw, pati oil reserve pa tinangay din. I bet, libre yong refueling at hindi pinabawad ni digong ang mga kaibigang niyang chinese. all for china motherland, he is. The last presidential election (2016) is a suitable reference. Sabi ng ilan, hulog daw langit at ‘anointed’ ng diyos. anointed by false god and coming from hell more like. yin yang gone bulok, bad feng shui pa, lower IQ evident. true biyaya only for the chinese at talagang hulog ng langit; for pinas, a yoke.
. . . x x xMany contracts must have been made in reliance upon its assumed force. It must be Presumed that the public schools have been kept, teachers employed, Police and fire protection afforded, highways constructed and maintained, the poor relieved, and other necessary attributes of the government of a city performed. It is quite possible that the power of eminent domain has been exercised. Money doubtless has been borrowed and the credit of the city in form pledged for its payment. Without further enumeration, it is manifest that great havoc in divers directions that can be foreseen, and doubtless in sundry others not now in mind, would be wrought by issuing a quo warranto against Methuen for usurping the franchise of a city. The evil consequences which would flow from issuing the quo warranto would not be in any measure lessened by the circumstance that the Attorney General had no knowledge of the invalidity of the city charter of Methuen until it was called to his attention by the relator.
. . . The evil consequences which would flow from issuing the quo warranto would not be in any measure lessened by the circumstance that the Attorney General had no knowledge of the invalidity of the city charter of Methuen until it was called to his attention by the relator. There must be timely assertion even of constitutional rights. Ignorance of pertinent facts is not generally an excuse for failure to vindicate them seasonably. Lebowitch, petitioner, 235 Mass. 357 . – All these considerations lead to the conclusion that it would not be a discreet exercise of judicial power and would not be in conformity to the general public interest to grant the relief prayed for. Whatever legal consequences may flow from the fact that the city charter of Methuen is an unconstitutional statute must be met as and when they arise. Our refusal, in the exercise of sound judicial discretion, to issue the extraordinary writ of quo warranto under the circumstances, cannot affect those consequences. Those consequences may be alleviated so far as possible by taking the obvious steps to remedy the present situation, and to put Methuen upon the basis of a constitutional charter. Information [ quo warranto ] dismissed. If only they read your research @leona, and considered your informed opinion. 8 to 6, the 8 corrupted dragging the 6 in the process. there are few good men and women in supreme court and without sereno, the most senior of them is medyo waffling na. sereno carried and personified the dignity of supreme court and with her gone, hell breaking na ang supreme court. thanks but no thanks to the bent 8.
enforced barter na sa shoal, our fishermen forced to concede their catch kahit ayaw nila ng barter. when boarding our fishermen’s bangka, armed chinese coastguard never said, we come for barter, your catch for our noodles and water. pero, it’s only duterte, cayetano and roque who initially said ‘barter’, could well be that they knew beforehand there was going to be barter and gave their unanimous okay. so treasonous this govt, tapos tambays pa ang pinagkainitan! tambays were brought into the barter as well, made into whipping boys. lorenzana and esperon must be happy. to the taumbayan, malakanyang said we do not conceded. to the chinese, malakayang said do what you like! he, he, he. dalawa ang mukha is the game of the regime. Are there more similarities between Chinese President Xi Jinping and Special Assistant to the President Christopher “Bong” Go apart from their Chinese blood? Bata-bata ito ni Xi Jinping eh,” he said. ah, si bong go yata is the real power behind the throne, laging nasa taba yan ni digong, mayhap making all decisions and ruining the country, then mayhap again, reporting to chinese masters all that conspired. nothing escape bong go. and already he’s promoting himself anywhere he goes, nag-epal ng husto, parang dengue na nagkakalat, he, he, he. giving t-shirts na siya at marami pang mga gamit, making himself known here, there and everywhere and spreading influence, all for a reason: the chinese connection reinforcing. also with sereno gone, carpio is getting quieter na. lost an abay in the supreme court he did and looking the other way na siya. rolling over the ocean, rolling over the sea, rolling over the deep blue sea . . . a lumot in the making. previously po, carpio’s talk as regards china is generalized and distant. bet, he cannot deal the true face of china, the real front of china right among us, staring straight at him. he, he, he, calling bong go, how’s the daily weather report in china? Is it utterly FAIR for JBC to QUIZ applicants to the Supreme Court? Questions either that may make applicants pass or fail in their answers? These applicants ALREADY passed the BAR EXAMS! Do they have to pass JBC quizzes anew? Are these specific quizzes PART of the ROLE in creating the JBC under the Constitution? I do not believe so. This form of a TEST is making a QUISLING – a traitor who collaborates with an enemy force occupying their country. The PNP lately (daw) will stop displaying suspects in a line-up to the public/media. CHR lauded it because the rule is – these suspects are presumed innocent until proven guilty. Unfair to be quisling, quizzling but maybe good to be quised/KISSED. JBC – STOP the quizzes. It doesn’t work. Imagine an applicant-judge, justice or lawyer to READ controversial and unpalatable SC cases just to get to know when quizzed on it by JBC people. That’s TORTURE again for a legal practitioner. uhm, it’s like miss universe po, the contest is harrowing for contestants. they have already won titles back home, and yet they have to go through rigors again only harder this time with world wide audience, richer sponsors, more discerning judges, trickier questions and harder still is that they have to compete with fellow beauty queens, some prettier and smarter with university degrees, quicker studies and can hit the ground running. nerve of steel is needed and many women have shown they have got it takes! and the reward is immense! many title holders have gotten rich and famous, married rich and titled husbands, becoming talk show hosts and politicians. they become authorities and forces to be reckoned with. same with movie stars, they still have to audition for roles kahit veterans sila sa showbiz. separating po the chaff from the grain, the the goal of gate keepers as jbc. methink. I think lawyers and judges are willing to go through hoops just to prove their sincerity, commitment and dedication to the job. may probity po sila at nanunuyo. candidates are put through their paces. it may sound harsh but all job applicants go through process of elimination. I think, jbc is looking for keywords and if candidates mention those keywords and able to discuss them, they are more or less on the ball. to the winner, honor and fame awaits. pay is good with lots of benefits, travel overseas included. may good working conditions, paid leave, etc. it’s worth the bother of going through the paces. the experience alone is payment enough, an eye opener for many. From news report: Sec. Cayetano slammed Sens. Trillanes IV & Rep. Alejano for endangering Philippine security by alleging that Pres. PDutz has stopped navy patrols in the WPhil Sea. The SECRATARY said: That government forces are conducting patrols in the West Philippine Sea. Where is/are the proof to this? 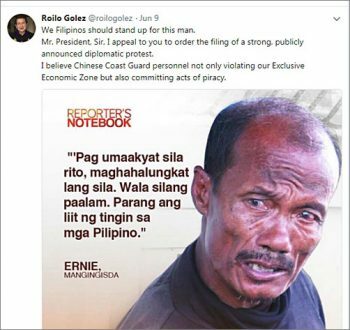 If indeed there is on-going navy/coast guard PATROLS, why then were our Filipino fishermen victims of Chinese forces patrols in GIVING UP their FISH? Where are our naval gun boats? Our Coast Guard ships? Proofs that they are there patrolling is a picture better than a Secretary’s words in hundreds/thousands. It would be more embarrassing to see our government patrols there and not doing anything when Chinese forces patrols are taking our fishermen’s FISH. So, the idea to avoid that, NO PATROLS on Philippine side. We do not even PROTEST much to China’s INVASION of our territories on the idea: We cannot fight CHINA. Suicide daw. Yes, China will investigate the FISH TAKING. Not the Philippine investigating also? Why China? The FISH were ours. Chinese Ambassador gave a TIP: ‘Twas a BARTER as to the FISH TAKING, this is a HINT as to the outcome of China’s investigation. No PUBLIC PROTEST. NO patrols. No Investigation. No FISH. All these rolled into ONE means – Philippines is ONE with CHINA. How does Indonesian forces deal with Chinese INVASION of their FISHING GROUNDS? THEY shoot Chinese fishing vessels and SINK ‘EM! No more invasions since then. Militarily, Indonesia is not at PAR with mighty CHINA but they know how to more than PROTEST with invasions by others by SHOOTING ‘EM to sink Chinese fishing vessels. Guts they have. Has China gone to war with Indonesia? No. PDutz imagines otherwise on a war with China. That’s why China loves to BULLY the Philippines! Secretary Cayetano, show PROOF we have those PATROLS. Show proofs that our forces deals with invasions on our territories by China and others. Proof! Proof and PROOFS are more than a thousand words of the truth and NOT a LIE. Baka PATOLA is what the Secretary means. We have PATOLA patrols at West Philippine Sea. What’s our morning MENU today? FISH with PATOLA! Still under MODERATION. Thank you AFTER release. thanks to cayetano po, he’s fast becoming patron saint of chinese navy. I am betting po chinese navy burn incense for cayetano, his mind fogged. question, when is chinese navy going to invite their patron saint for trip around the cay? answer, when bong go says so. Latest in Chinese way. . .
Now, we are reading the news. . . in CHINESE at Manila Bullytin! uhm, the chinese speak better english than anyone, only they dont want people to know. stealthy they are and very good in pretending. I think, it gives the chinese immense pleasure seeing and watching people try so hard to communicate with them, exerting so much effort and exhausting themselves in the process. bet it make the chinese feel like kings and being catered for. trust the chinese ingenuity, they know a lot of things. knowledge if power and info is somehting they dont want to share. give them the edge too. (Wài méi bàodào) déguó zǒnglǐ mò kè’ěr 6 yuè 10 rì jiēshòu déguó diànshì yī tái zhuānfǎng shí biǎoshì, tè lǎng pǔ yǐ tuī wén de fāngshì tuīfānle tā duì qī guó jítuán zuìzhōng shēngmíng de zhīchí, zhè ràng wǒ gǎndào yāyì, shènzhì yǒuxiē jǔsàng. Déguó zǒnglǐ mò kè’ěr zài jiēshòu diànshìtái zhuānfǎng shí hái biǎoshì, zhè hěn nán, zhècì shì lìng rén shīwàng de, dàn zhè bù děngyú qī guó jítuán wánjiéle. Mò kè’ěr duì jíjiāng zhàokāi de běiyuē fēnghuì gǎndào yǒu yālì. Leona, your wish is my command…Signed M. Andanar…. Mr. Shao Pao – I like JOHN WOO movies! part of one road, one china yata yan. kaso, baka all these promotional gastos is sagot ni durterte, the money taken from the kaban ng bayan. alam mo naman ang chinese, they want everything for nothing! umpisa na baga ito ng nationwide chinese indoctrination, duterte kasi cannot solve the nation’s problem, kaya leaving it all to the chinese na lang. jin ping’s insider na si bong go must be over the blood moon! pinas is sold for a song. cheap. and the bad thing is that those chinese programs (worth millions) could well be part of the chinese loans entered into and agreed by duterte. useless loan of not much use to many. I hope Roilo Golez will have a peaceful travel in the next life. I did not know the man. Rest in peace peacemaker. The color photo of Mang ERNIE the Pinoy fisherman in this article shows his expression of angst a dreadful anxiety of his condition as a Filipino fisherman fishing in our Seas. Ang liit ng tingin sa mga Pilipino! That remark is a protest. China, ang liit ng tingin niyo sa mga Pilipino! Hinalungkat niyo ang aming mga teritoryo sa karagatan! Ang mga isda ay aming yun! Mga pirata kayo ng buong Asia! Look at Mang Ernie’s facial expression. Sec. Caye! Sec. Roque! Do you guys need to establish the stealing and bullying by CHINA? L.OOK AGAIN at Mang Ernie photo! Testicles you ain’t got. . . my golly! A public protest – AYAW PA! file diplomatic protest kuno, urged golez. of course digong will file diplomatic protest, only the protest will not be posted and might not even leave his office. anyhow, why do pinoys have to wait for digong to file protest? kung inept siya, taumbayan can file protest and then troop to chinese embassy and lodge it. if the mountain wont go to mohamad, then mohamad will go to the mountain. waiting for what will not happen is hopeless. better do it and file the protest themselves. the worse that can happen is kapolisan will be block access to chinese embassy. he, he, he, then taumbayan will do protest in the only way they know and that is to harass, scam, duped chinese tourists in pinas. steal from the thieves, funny that one. might even get golez’s blessing, heard the man got sense of humor. Are the Chinese Coast Guard units that goes into our territorial seas that HUNGRY! that they want the FISH? Nag hahalungkat ng mga nahuli na ISDA? Sigue! ihatag nyo! Kawawa naman sila. Na gugutom! Papaano lalaban sa US Navy yun mga iyan…gutom sila! Mang Ernie…inubos ba pag kuha yun mga ISDA NYO? Walang natira? the greed of the chinese has no end, walang hantulan, walang hangan, stealing fishesfrom the poor! nag-barter kuno, fishes for noodles and water. our fishermen dont want noodles and water, they want their catch to sell in the market, the proceeds used to feed their families, pay bills, send their children to school. at kung ano man ang natira ay iiponin for the days in case magkasakit sila, may panggasto’t pambili ng medicine. the chinese coastguards took away any hope of the fishermane’s meeting their familial obligations. and all defence sec lorenzana can do is blame the previous admin! for his own inaction, lorenzana blamed the previous admin. ang comfort man ni digong has very fancy title. Isipin nyo! . . . Isang Bilyun tatlong daan milyon ang Chinese! Kakain yun mga yan! Pag naging mga ZOMBIES sila, sino ang matitira? Lalanggnoy sa lahat ng karagatan ‘O lalakad sa lahat ng lupa PARA kumain! Ang barter nila AY: Kakainin ko ikaw ‘O mag fishing ka muna! Ang CHINA pa-punta saan man hanggang walang katapusan. Ma liit na ang tingngin nila sa MUNDO! Kasi bully na abusado pa.
another UNDER MODERATION. Thank you after release.